The file system structure is the most basic level of organization in an operating system. The way an operating system interacts with its users, applications, and security model nearly always depends on how the operating system organizes files on storage devices. Providing a common file system structure ensures users and programs can access and write files. Shareable files can be accessed locally and by remote hosts. Unsharable files are only available locally. Variable files, such as documents, can be changed at any time. Static files, such as binaries, do not change without an action from the system administrator. Categorizing files in this manner helps correlate the function of each file with the permissions assigned to the directories which hold them. How the operating system and its users interact with a file determines the directory in which it is placed, whether that directory is mounted with read-only or read and write permissions, and the level of access each user has to that file. The top level of this organization is crucial; access to the underlying directories can be restricted, otherwise security problems could arise if, from the top level down, access rules do not adhere to a rigid structure. Red Hat Enterprise Linux uses the Filesystem Hierarchy Standard (FHS) file system structure, which defines the names, locations, and permissions for many file types and directories. The FHS document is the authoritative reference to any FHS-compliant file system, but the standard leaves many areas undefined or extensible. This section is an overview of the standard and a description of the parts of the file system not covered by the standard. The ability to mount a /usr/ partition as read-only. This is crucial, since /usr/ contains common executables and should not be changed by users. In addition, since /usr/ is mounted as read-only, it should be mountable from the CD-ROM drive or from another machine via a read-only NFS mount. The directories and files noted here are a small subset of those specified by the FHS document. For the most complete information, see the latest FHS documentation at http://refspecs.linuxfoundation.org/FHS_3.0/fhs-3.0.pdf; the file-hierarchy(7) man page also provides an overview. The directories that are available depend on what is installed on any given system. The following lists are only an example of what may be found. In the given examples, the mounted partition /dev/shm represents the system's virtual memory file system. The du command displays the estimated amount of space being used by files in a directory, displaying the disk usage of each subdirectory. The last line in the output of du shows the total disk usage of the directory. To see only the total disk usage of a directory in human-readable format, use du -hs. For more options, see man du. To view the system's partitions and disk space usage in a graphical format, use the Gnome System Monitor by clicking on Applications → System Tools → System Monitor or using the command gnome-system-monitor. 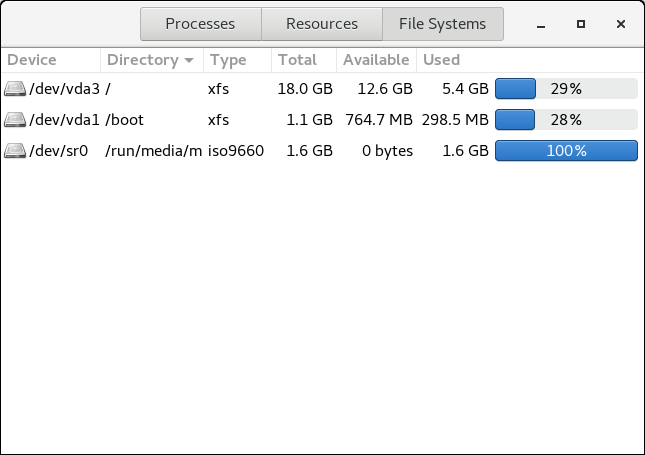 Select the File Systems tab to view the system's partitions. The following figure illustrates the File Systems tab. The /boot/ directory contains static files required to boot the system, for example, the Linux kernel. These files are essential for the system to boot properly. Do not remove the /boot/ directory. Doing so renders the system unbootable. virtual devices provided by the kernel. These device nodes are essential for the system to function properly. The udevd daemon creates and removes device nodes in /dev/ as needed. Devices in the /dev/ directory and subdirectories are defined as either character (providing only a serial stream of input and output, for example, mouse or keyboard) or block (accessible randomly, such as a hard drive or a floppy drive). If GNOME or KDE is installed, some storage devices are automatically detected when connected (such as with USB) or inserted (such as a CD or DVD drive), and a pop-up window displaying the contents appears. /dev/hda The master device on the primary IDE channel. /dev/hdb The slave device on the primary IDE channel. /dev/tty0 The first virtual console. /dev/tty1 The second virtual console. /dev/sda The first device on the primary SCSI or SATA channel. /dev/lp0 The first parallel port. A logical volume in a volume group, for example, /dev/mapper/VolGroup00-LogVol02. A traditional storage volume, for example, /dev/sdbX, where sdb is a storage device name and X is the partition number. /dev/sdbX can also be /dev/disk/by-id/WWID, or /dev/disk/by-uuid/UUID. For more information, see Section 25.7, “Persistent Naming”. The /etc/ directory is reserved for configuration files that are local to the machine. It should not contain any binaries; if there are any binaries, move them to /usr/bin/ or /usr/sbin/. For example, the /etc/skel/ directory stores "skeleton" user files, which are used to populate a home directory when a user is first created. Applications also store their configuration files in this directory and may reference them when executed. The /etc/exports file controls which file systems export to remote hosts. The /mnt/ directory is reserved for temporarily mounted file systems, such as NFS file system mounts. For all removable storage media, use the /media/ directory. Automatically detected removable media is mounted in the /media directory. The /mnt directory must not be used by installation programs. The /opt/ directory is normally reserved for software and add-on packages that are not part of the default installation. A package that installs to /opt/ creates a directory bearing its name, for example, /opt/packagename/. In most cases, such packages follow a predictable subdirectory structure; most store their binaries in /opt/packagename/bin/ and their man pages in /opt/packagename/man/. The /proc/ directory contains special files that either extract information from the kernel or send information to it. Examples of such information include system memory, CPU information, and hardware configuration. For more information about /proc/, see Section 2.3, “The /proc Virtual File System”. The /srv/ directory contains site-specific data served by a Red Hat Enterprise Linux system. This directory gives users the location of data files for a particular service, such as FTP, WWW, or CVS. Data that only pertains to a specific user should go in the /home/ directory. The /sys/ directory utilizes the new sysfs virtual file system specific to the kernel. With the increased support for hot plug hardware devices in the kernel, the /sys/ directory contains information similar to that held by /proc/, but displays a hierarchical view of device information specific to hot plug devices. This directory is used for binaries. This directory is used for system-wide configuration files. This directory is used for C header files. This directory is used for Kerberos-related binaries and files. This directory is used for object files and libraries that are not designed to be directly utilized by shell scripts or users. As of Red Hat Enterprise Linux 7.0, the /lib/ directory has been merged with /usr/lib. Now it also contains libraries needed to execute the binaries in /usr/bin/ and /usr/sbin/. These shared library images are used to boot the system or execute commands within the root file system. This directory contains small helper programs called by other programs. As of Red Hat Enterprise Linux 7.0, /sbin has been moved to /usr/sbin. This means that it contains all system administration binaries, including those essential for booting, restoring, recovering, or repairing the system. The binaries in /usr/sbin/ require root privileges to use. This directory stores files that are not architecture-specific. This directory stores source code. This directory stores temporary files. Red Hat Enterprise Linux's usage of /usr/local/ differs slightly from the FHS. The FHS states that /usr/local/ should be used to store software that should remain safe from system software upgrades. Since the RPM Package Manager can perform software upgrades safely, it is not necessary to protect files by storing them in /usr/local/. Instead, Red Hat Enterprise Linux uses /usr/local/ for software local to the machine. For instance, if the /usr/ directory is mounted as a read-only NFS share from a remote host, it is still possible to install a package or program under the /usr/local/ directory. Since the FHS requires Linux to mount /usr/ as read-only, any programs that write log files or need spool/ or lock/ directories should write them to the /var/ directory. The FHS states /var/ is for variable data, which includes spool directories and files, logging data, transient and temporary files. The /var/run/media/user directory contains subdirectories used as mount points for removable media such as USB storage media, DVDs, CD-ROMs, and Zip disks. Note that previously, the /media/ directory was used for this purpose.